← Where has my Oak chocolate milk gone? Are you feeling Green, or Yellow, or Blue? I saw this collection rubbish bins in Ultimo. With Green, Yellow and Blue lids. These days many local governments garbage collection services come with different bins for different types of rubbish. Of the bins below: green is actually general rubbish; yellow is general recycling; and blue is for paper recycling. 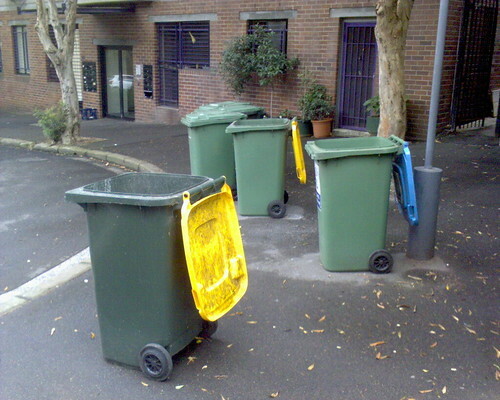 What colour bins does your council employ? Do they match these colours, or has your council decided to use its own colour coding? This entry was posted in Photos, Social and tagged bin, blue, green, yellow. Bookmark the permalink.